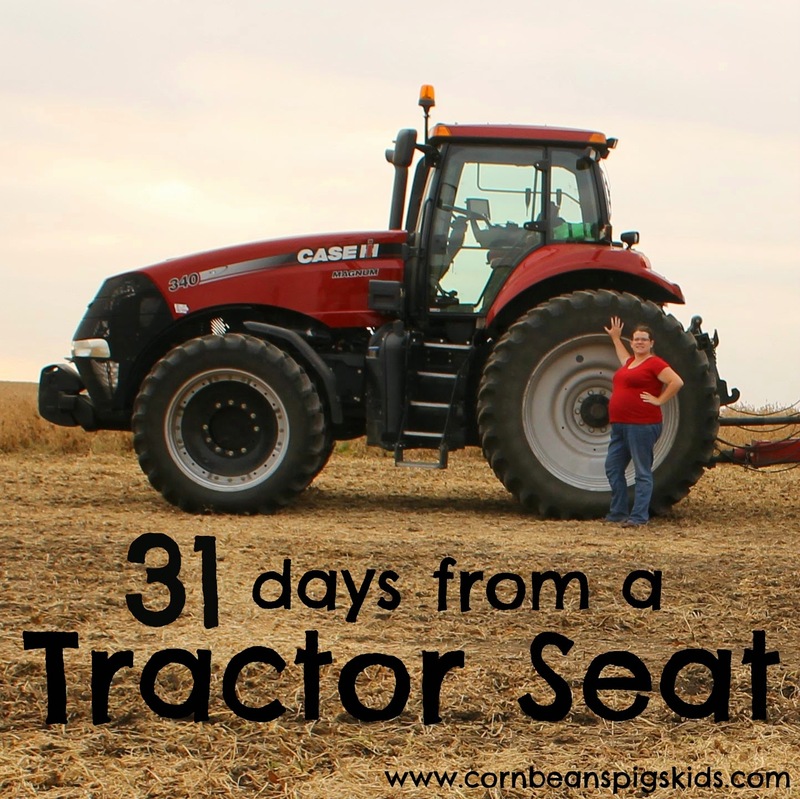 One feature this month through my 31 Days from a Tractor Seat series that I look forward to sharing are some of my family's "Tractor Approved" recipes. During fall harvest I have a unique situation where I find myself in the field pretty much all day, everyday, along with my husband and kids. Thankfully I have a wonderful mother-in-law that makes box lunches for us everyday at noon and for supper we usually just send whoever is in the semi-truck to pick up some food from the nearest food establishment from the field. The downfall of this situation is that we don't have that much food in our house during harvest because I don't have that much time to run to the grocery store, especially since we don't live that close to one that is open 24 hours and on Sundays... But anyways, I try to keep some staples in the house so when we do find ourselves at home we can eat something at home. 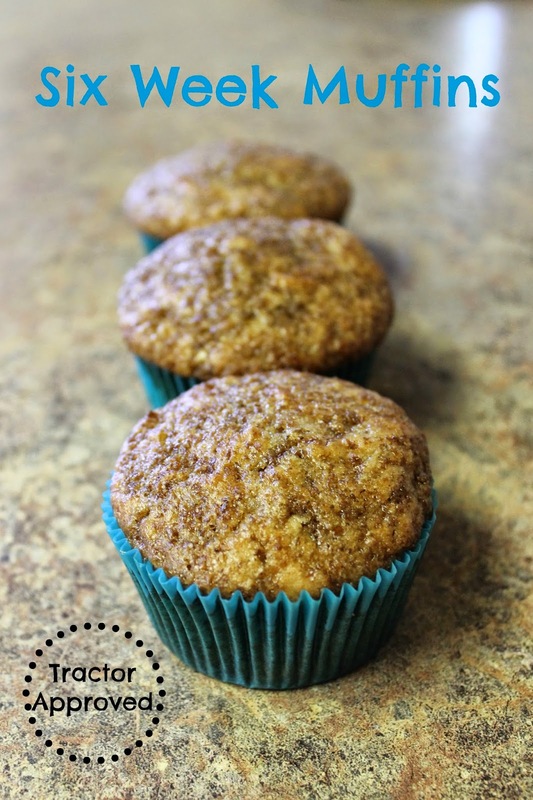 Today I'm going to share one of my go-to breakfast muffins - Six Week Muffins! Why do Six Week Muffins get the "Tractor Approved" seal? First, my entire family loves them. They are a hardy muffin that has a slightly sweet flavor. Second, they are convenient for you to take on the road (or in the field). During harvest sleep can become an elusive thing, so there are days that you literally wake up early enough to just put on a pair of clothes and get out to the field. And when you work long hours you really need a good breakfast to get you going, so these muffins are great to grab on-the-go. Third, you can keep the batter in the refrigerator up to six weeks so you make fresh muffins as much as you want. I usually split the batter in thirds and make 18 at a time every couple of weeks. You may cover and refrigerate the batter up to six weeks for fresh muffins as much as you want. What are some of your go-to on-the-go breakfast foods? Remember to Comment for a Cause! cereal in a muffin recipe. Cool! Hardest part of harvest is preparing the lunches and meals. Especially if I have to drive the tractor. Like to prepare our own meat ahead for sandwiches. Try to get fruit and veggies included. Have lots of soup made for evening when we get in. My standby sandwiches for fall and spring are ham salad, tuna salad and chicken salad. They're easy to throw together and quite a few of the ingredients come from the pantry or freezer. I have this exact same recipe from a former church member at one of my dad's churches!!! This made me remember how much I loved it and need to get it out and make it again!! Thanks Val!!!! You'll be happy you revisited the recipe! It's a good "fall" recipe I feel too. I've never heard of a recipe like this!! I cannot wait to try it out! It sounds/looks delicious! They are nice and hearty! A great start for the entire family's morning. I have added raisins, small diced apples, Chocolate chips or cinnamon and sugar on the top for some variations. I add these only to the batter that I am baking. wow! This is almost like the recipe my mom found in the Des Moines Register MANY years ago. The recipe had a lot of oats that you mix in after making the batter.